DIRECTIONS: Auction to be held at 415 Dewey Street, Two miles North of Churchville, off of Route 19 take Reed Rd. East OR off of Route 36 take Dewey Street West. 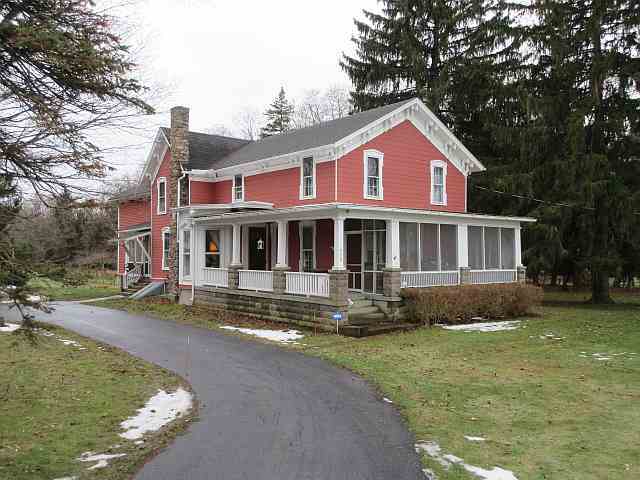 REAL ESTATE: Selling at 10:30 am will be a Charming Homestead with 12 room farmhouse, 2 car garage, circular black top driveway, barns, hard wired generator and pastures situated on 8 acres. Home has 5+ bedrooms, 2 updated baths, large modern kitchen combined with 10 foot tin ceilings, French doors, and large picturesque screened porch. This is your HGTV dream! Property sells to the highest bidder, Private financing is available for qualified parties. A $15,000 deposit is required to bid. A 10% Buyer's Premium will be added to the top bid on the Real Estate. OPEN HOUSES: Saturday, May 4th from 10-11:00A.M. And Tuesday, May 7th from 4-5P.M. For more info or call Penne at 585-303-2325 or Shelly at 585-683-0995. ANTIQUES AND COLLECTIBLES: Mahogany High Boy; Walnut Dresser; 2 Walnut ¾ size beds; Full Size Bed; Jenny Lind Twin Size Bed; Oak 2 Door Bookcase; 2 Oak Library Tables; several commodes; MT Victorian commode; Several one drawer stands; Tiger Maple one drawer stand w/ cherry top; Victorian Parlor Stands; Mahogany chest; What-Not-Shelf; Fern Stands; Walnut Wall Mirror; Stick and ball corner chair; 2 Victorian Chairs; Rockers; 2 Painted Bookcases; Quilt Racks; 24” Tall Satsuma Vase (Very Interesting); G. Armani figurine; Oriental Figurines; Bookends; Paper weights; Linens; Quilt; Automobile Motion Lamp; Wall Mirror w/ child print; Framed Prints; Jadite S&P Shakers; Assortment of Glass and China; Stevens Model 66 Bolt Action 22 Rifle; Oriental Rug; Dinner Bell; Milk Can w/ tractor seat. HOUSEHOLD: Amish Made Queen Size Bed; Slant Top Claw foot desk; Recliner; Walnut Trestle Table; Dresser; Desk; TV Stand; Oak Stand; Assortment of Chairs; Hall Tree; Floor and Table lamps; Vacuum Cleaners;Rugs; Card Tables w/ Folding Chairs; Bookcases; Porch Furniture; Kitchenware; New Mail Box; Ladies Bike; Cross country skis; Sleds; Balance of contents of house. BARN ITEMS: John Deere D 130 Lawn Tractor (42” deck), 378 hrs; Troy Bilt Lawn Tractor w/ 42” deck; John Deere walk behind snowblower (electric start); Troy Bilt Rototiller; “Precise Fit” lawn cart; 2 Lawn Rollers; 2 power sprayers; garden cart; Wheel barrow; Aluminum step ladder; Wooden extension ladder; Vise; Bench Grinder; Come-along; Levels; 16” Cut Black and Decker hedge trimmer; Black and Decker Weed Wacker; Assortment of Hand and Yard Tools; Hand held Lawn sprayers; Have-a-heart Traps; Gas cans; Coleman.75 HP Handyman Powermate Air Compressor; Ship and Shore 12 Amp Battery Charger; Wooden Ramps; Wooden Truck Racks; Water Troughs; Rubber Feeders; Wooden Crates; Fencing;Electric Fencer; Metal Farm Gates; Small Pile of Hay and Straw; Bags of Wool; Cattle Chute. CONTENTS TERMS: 10% Buyer’s Premium if paid with cash or good check.A 13% Buyer’s Premium if paid with Credit Card. Everything sells AS IS.